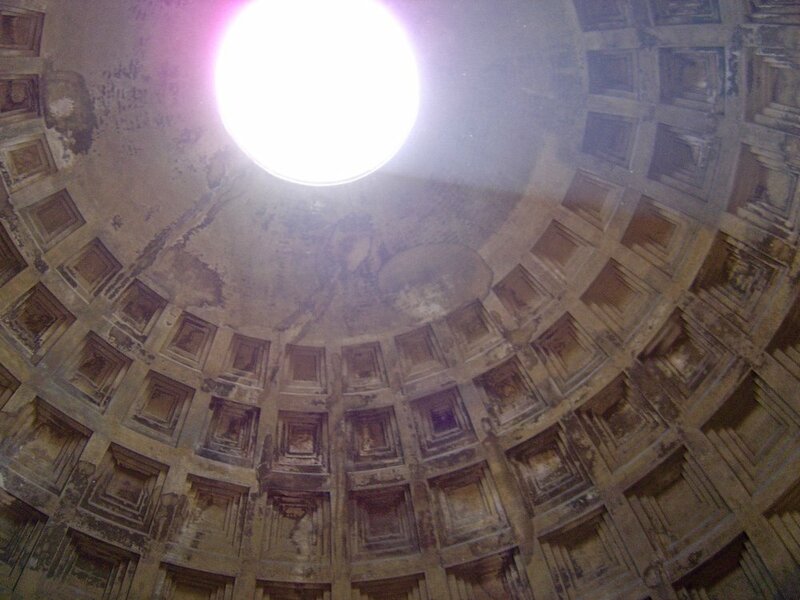 Pantheon Facts: What's The Difference Between The Paris Pantheon and The Roman Pantheon? Yes, there are two famous Pantheons that you can visit in Europe — one in Paris and one in Rome — but they were both constructed for very different reasons, and were built hundreds of years apart. One of the city’s most well preserved ancient buildings, the Pantheon in Rome was originally built as a temple to the Olympian gods (Pantheon literally means ‘all gods’) as a place where people who had different beliefs could gather and worship together. It was completed under the patronage of the Emperor Hadrian between 125 and 128 CE and was constructed on the spot of a previous temple, built by Agrippa in 27 BCE, that had burnt down a few years earlier. After passing through a series of massive marble columns, visitors to the temple enter an enormous circular room (called a rotunda) with walls that are 20 feet (!) thick and a floor covered in huge slabs of colorful marble. The marble extends to the exterior of the room where it is joined by decorative columns and pilasters. The original 7 niches, once containing statues of the gods, are still there but now either sit empty or hold Christian relics. In 609 CE, Pope Boniface IV dedicated the Pantheon as the Christian Church of St Mary and the Martyrs. Though this wiped away the building’s original purpose of being inclusive to ‘all gods’, it ensured it’s survival through the Middle Ages when Pagan temples were being destroyed. The interior dome of the Pantheon is a staggering 143 feet in diameter and has patterns cut into it that may have once contained gilded bronze rosettes or stars to mimic the night sky. The central opening, called and oculus, is 29 feet wide and lets the sun and rain fall through it equally. Small holes in the marble floor beneath the opening, placed there by the original engineer, drain any water that falls. What most visitors don’t know is that there were once gilded bronze roof tiles inset into the remarkable ceiling. Unfortunately, they were looted and removed by an emperor from the Eastern/Byzantine Empire around 500 AD and in the 17th century Pope Urban VIII had them melted down. He then gave some of the bronze to Bernini who created the baldaccino (canopy), that can be currently seen over the main alter in St Peter’s cathedral, and used the rest to have 80 cannons for Castel Sant’Angelo made. 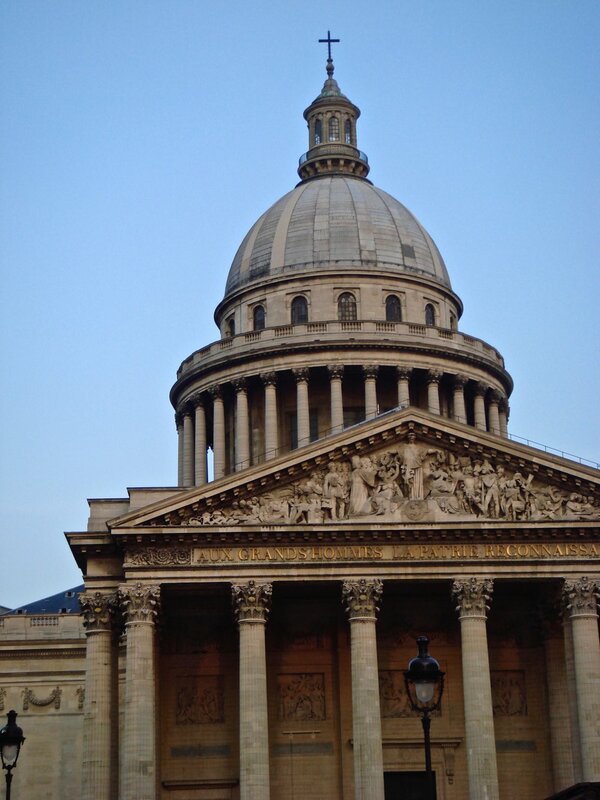 Also an impressive building, the Paris Pantheon has a very different history than the one in Rome. Located on the south side of the river near the Luxembourg Gardens, the huge, extravagant 18th-century neoclassical structure that exists now was originally built as a church by Louis XV dedicated to St. Genevieve (her body was buried in a basilica that existed on the site in 512 AD) to give thanks for his recovery from a dire illness. Though it was built to serve as a church, the construction was completed the year that the French Revolution broke out (1789), and two years later it was converted into a mausoleum. It is the resting place of some very famous names — scientists Marie (the first woman to be interred in the Pantheon) and Pierre Curie, Voltaire, Jean-Jaques Rousseau, and Victor Hugo just to name a few. The building's facade is clearly modelled after the Roman Pantheon, but the interior looks like a grand Gothic cathedral. Arched ceilings, stunning frescos, and imposing architecture make this spot well-worth the visit. It also hosts, arguably, one of the best views in the city from the exterior of the dome (you can visit it on a tour).